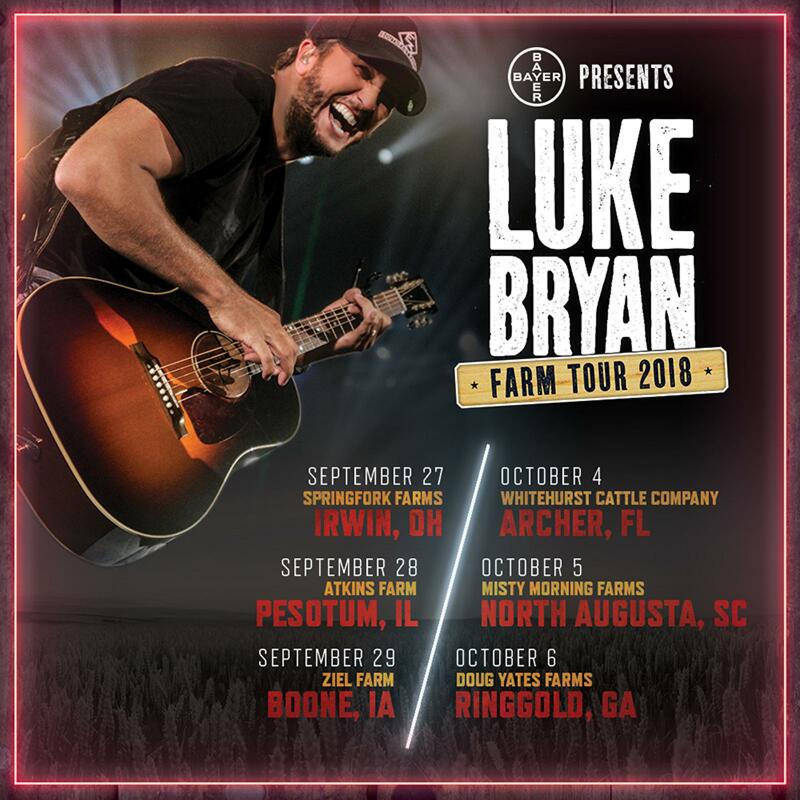 Luke Bryan Farm Tour 2018 - Just Announced! As a nod to his own family upbringing, country music superstar Luke Bryan will once again honor the American farmer this fall as his tenth annual FARM TOUR is set for September 27 to October 6. Luke will take the six-city tour from Ohio to Florida setting up stages in the fields of local farmers across those states. Over 100,000 fans have attended the tour each year since its inception in 2009. Luke will continue giving back to the farmers by awarding college scholarships to students from farming families who are attending the local college or university near the tour stops. To date, more than 50 scholarships have been granted. Tickets for the "Bayer Presents Luke Bryan Farm Tour 2018" go on sale June 6 at 10AM local time at www.lukebryan.com/FarmTour. Presale tickets for Luke's Fan Club (the Nut House), Luke’s official App and Citi® cardmembers at www.CitiPrivatePass.com begin June 1 at 10AM local time. "I can’t believe we’ve been doing this 10 years!" said Luke. "Our goal was to bring big-city production concerts into these small towns across the U.S. giving those communities the opportunity to attend shows that would never come their way." Bayer will continue their #HeresToTheFarmer campaign. For every share, Bayer will donate a meal to someone in need through Feeding America®. In years past nearly 2 million meals have been donated and $140,000 went to area food banks and local farmers in each of the tour cities.Visit HeresToTheFarmer.com to learn more. The tour is sponsored by Bayer, Chevrolet, Cabela’s, Can-Am®, Citi®, CID, Monster Energy and Verizon. Luke Bryan has once again partnered with CID Entertainment to offer Harvest Time VIP Experiences throughout the 2018 Farm Tour. VIP Experiences include a Farm Tour ticket, VIP viewing area access, private restrooms, and merchandise gifts. To view Luke Bryan Farm Tour VIP Experience details, please visit https://www.cidentertainment.com/events/luke-bryan-farm-tour.